An Acoustic Duo. That means there are just the two of us playing acoustic guitars and singing. We do not use backing tracks, we simply arrange some great songs and really and honestly perform them live. 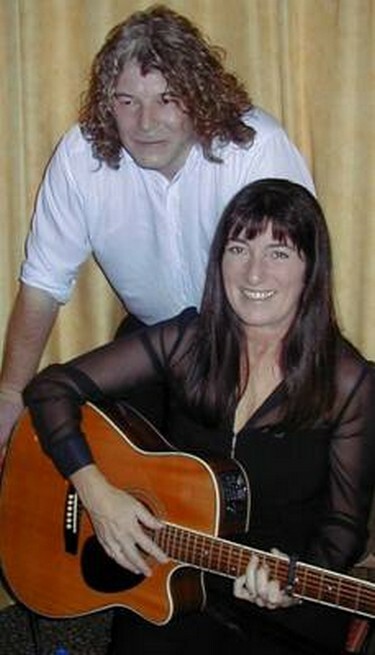 Tina is the vocalist and plays rhythm on her Takamine acoustic whilst Alex plays lead on his Washburn guitar. He�s a great guitarist and really makes a song come to life. Both Tina and Alex have performed professionally for many years and have a deep love of music. We are based in Welwyn Garden City in Hertfordshire but are happy to perform in different places around the country (or even outside the country). Our song list spans a number of decades and includes soft and gentle love songs, as well as lively and uplifting numbers. They are all recognisable and will enhance the atmosphere of any event or venue. Live music creates a relaxing and comfortable ambience. Perfect for the end of the conference during dinner, or perhaps before the meal in the bar or even at the end of the evening to help your delegates relax and wind-down before retiring. Your Summer barbeques, garden parties or business lunches will be unmissable and unforgettable. Stimulate your guests with some nostalgic songs from the 40�s to the Nought�ees. They�ll love the selection of songs from slow, smoochie love songs to singalongs. See the song list. Tired of string quartets and jazz. Treat yourself to live acoustic arrangements of familiar (and not so familiar) songs all performed with love, tenderness and a little passion. A truly superb experience. A perfect sound to entertain your customers. Not too noisy or intrusive. They�ll enjoy the peaceful, easy feeling we can create together and want to come back for more.